Everyone loves Jell-O. Heck, even the Doctor loves him some Jell-O, as well as fish fingers, custard, and Jammie Dodgers of course. 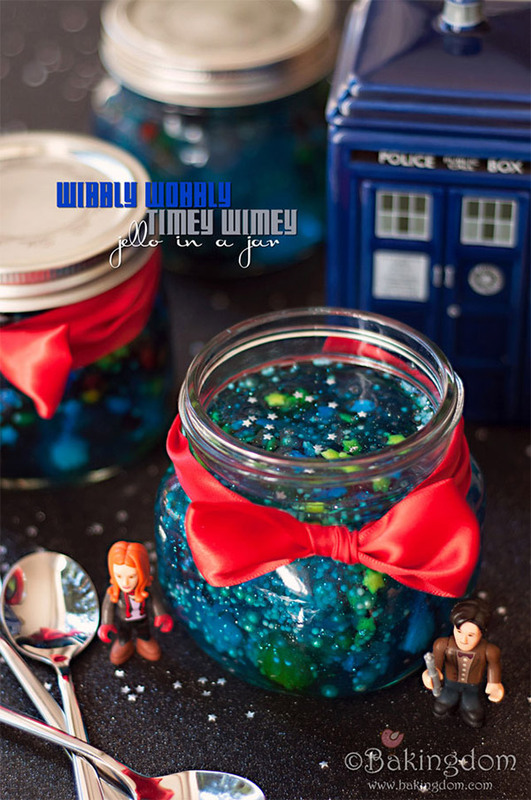 This special Doctor Who Jell-O will give you a nice, wibbly wobbly snack for that Who marathon you are planning. If you you want to make your own galaxy in a jar, made of Jell-O, you can find the recipe at Bakingdom. You see, it looks like a galaxy. In a jar. The TARDIS as well as Doctor and companion figures are optional. You don’t need them to enjoy this treat, it just makes it taste even better when you have props. I wonder if the TARDIS would get stuck in a Jell-O universe or just keep going.